In typical New Year’s fashion, I’m bringing in 2013 by eating better. After being informed by my doctor that I’ve gained 20 pounds (EEK!) since I last saw her, now is a better time than any. I’ve heard nothing but good things about PCRM’s (Physicians Committee for Responsible Medicine) 21-Day Vegan Kickstart program so I wanted to give it a try. Based on research by Neal Barnard, M.D., a leading health advocate, the 21-Day Vegan Kickstart is excellent for anyone looking to get healthy and lose weight, whether you eat meat or plant-based foods. Conveniently starting at the first of each month, each program provides recipes and tips from celebrities and experts. The program offers some delicious-looking meals which make enough for two to four people. 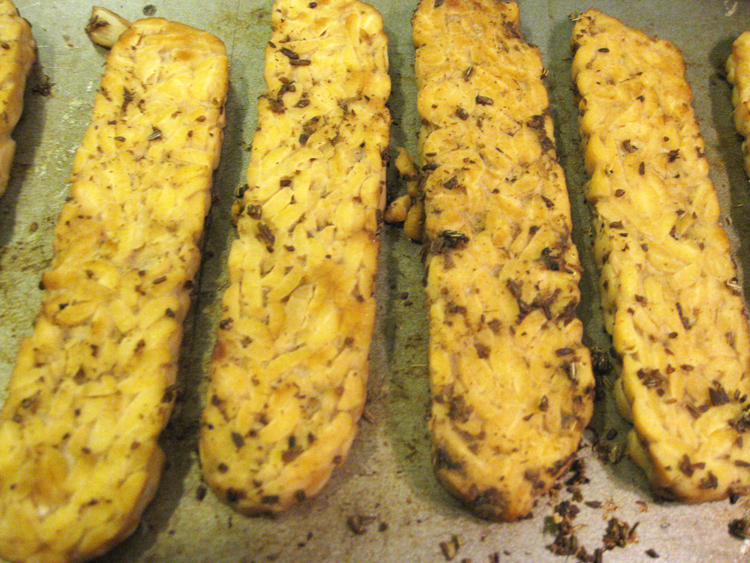 For those who avoid gluten, gluten-free options are provided as well. Should you like to prepare in advance, you can download a list of grocery items you will need. Very helpful! In addition to offering a program in English, PCRM offers programs for those who speak Chinese, Indian and Spanish. To learn more about the 21-Day Vegan Kickstart program, check out the website here. After the first seven days I’m feeling pretty darn good. I don’t own a scale but recently got a gym membership and weighed myself there — I’ve lost 5 pounds! Off to a great start. The oatmeal was a good start to the day, though I made four batches. Why? I wasn’t thinking! 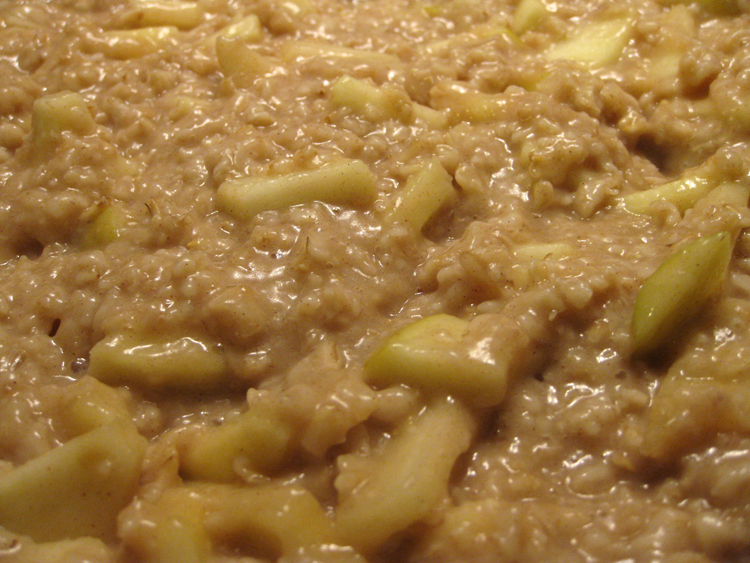 The oatmeal was very filling, with the apples providing subtle sweet and sour notes. I added some ground cinnamon to boost the flavor. Unsweetened oatmeal takes a little getting used to though, as, if you’re like me, I usually have some form of sugar in mine. This is much healthier though! 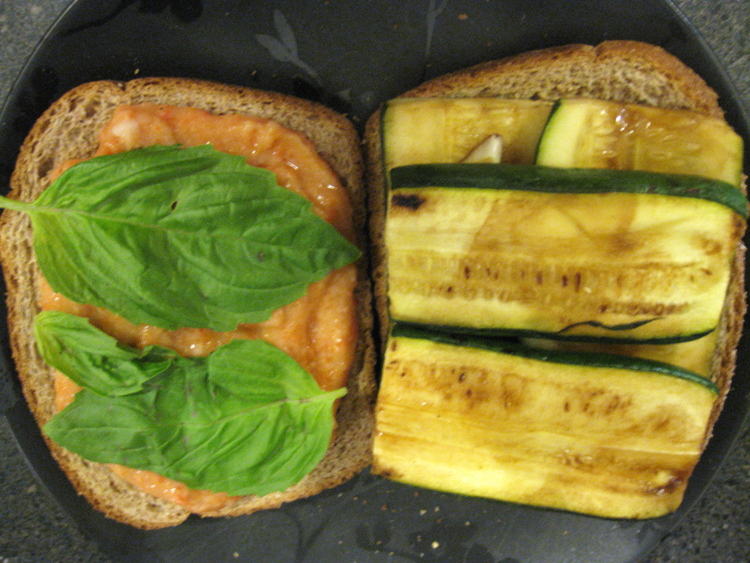 The Balsamic Zucchini Sandwich was a creative sandwich which utilized cannellini beans and roasted red pepper as a spread and then was topped with fresh basil in addition to the grilled zucchini. By now I was craving a little salt and the Ethiopian-inspired Curried Tomato Lentil Soup did not disappoint. It was very good with a nice kick, though it is more like a stew than a soup. 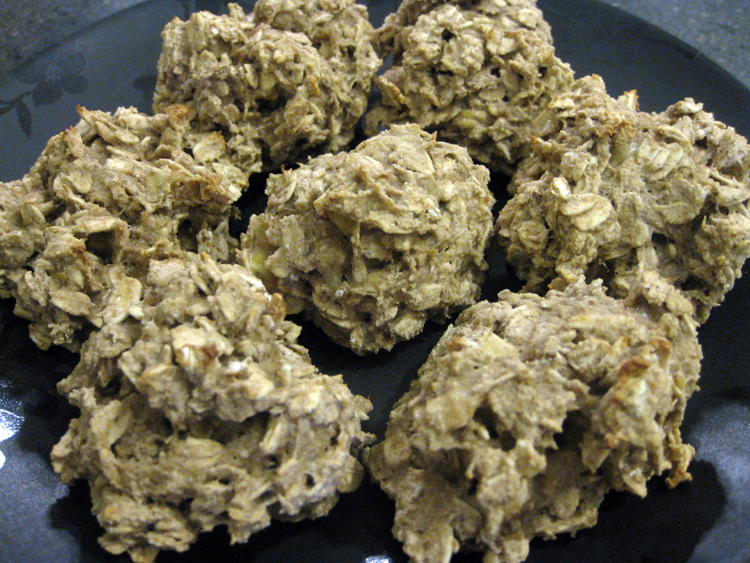 Though I felt I had more than enough food to eat today, I couldn’t avoid making the Oatmeal Banana Bites because they sounded so good! I wasn’t disappointed with these either. They have just enough sweetness thanks to the banana, and the addition of cinnamon and fresh nutmeg is delicious! 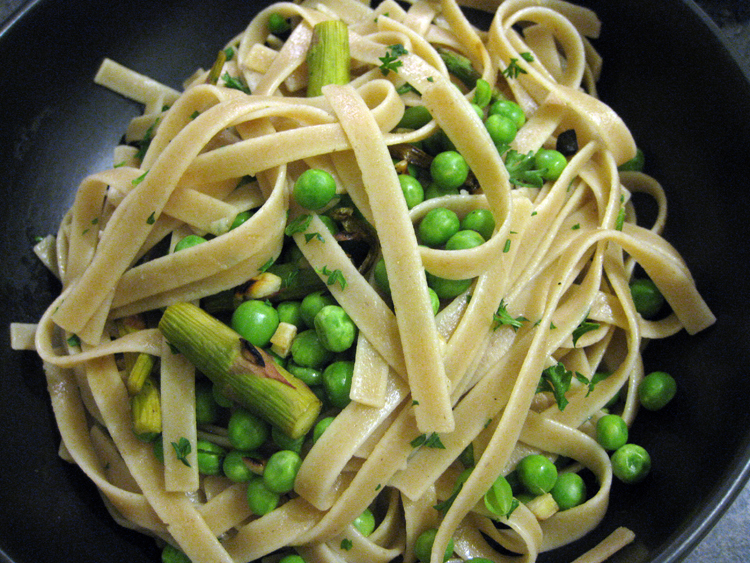 For dinner, the Fettuccine with Asparagus, Peas and Lemon was decent though it didn’t have a lot of flavor. The lemon juice and garlic did help though. The Baked Marinated Chickpeas were really good and they also give the pasta an added bit of flavor if you choose to mix the two. For breakfast today rather than having cereal, banana and berries as suggested, I had a strawberry smoothie since I had some berries that were about to go bad. In addition, I was supposed to have a Hummus and Sun-Dried Tomato Wrap for lunch today but I had leftover lunch from yesterday so I opted to eat that. Wasting food would be such a shame! Back on track now, I enjoyed the Ginger Banana Smoothie as a snack. It contained multiple kinds of fruit, and the addition of cinnamon was tasty! 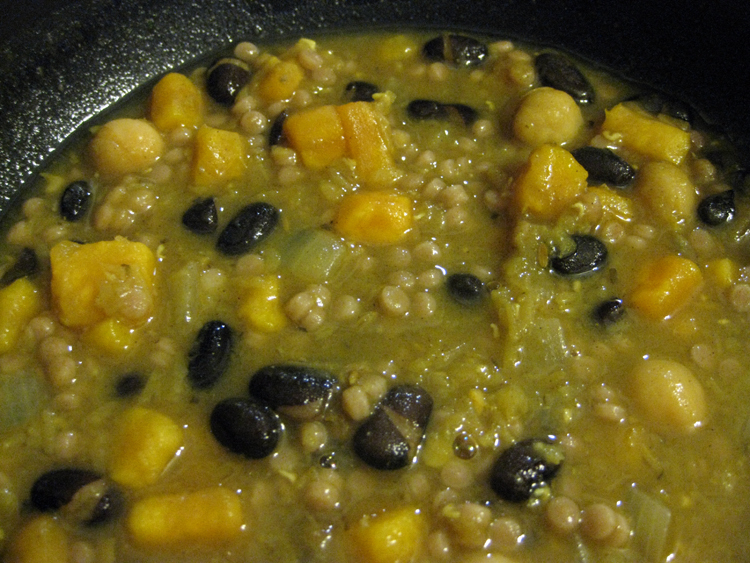 For dinner, the Moroccan Bean Stew with Sweet Potatoes, with a side of Couscous was a fun change. I enjoy eating a variety of foods, especially from various cultures. Since I wasn’t provided with a specific couscous recipe, I prepared some plain whole wheat Israeli couscous and added it to the stew. And even though I’m a bit burnt out on sweet potatoes, I really enjoyed this stew and feel that the mix of flavors worked well together. Today I had leftover Green Apple Oatmeal for breakfast and Blue Corn Chip Salad for lunch. 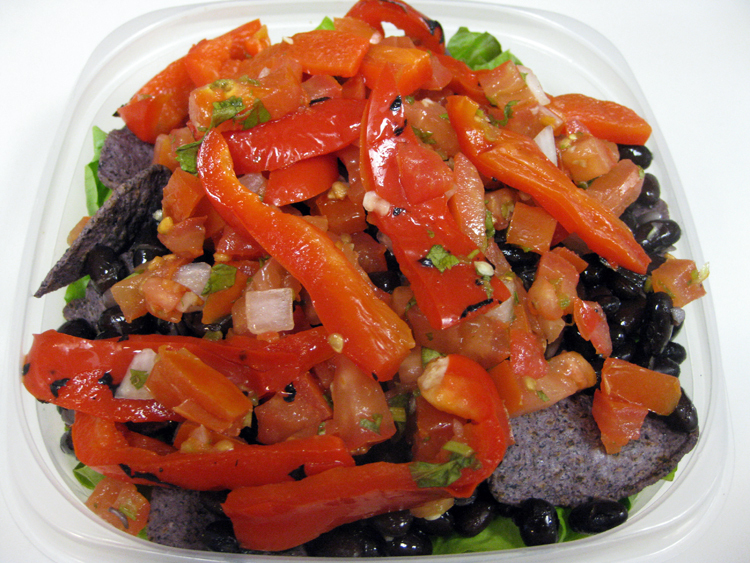 The salad consists of baked blue corn chips, red leaf lettuce, black beans, salsa, tomatoes and roasted red bell pepper strips. It also calls for diced tomatoes but with the salsa I felt mine had plenty. The salad was light and fresh, yet filling. I received a couple of comments at work about how good it smelled! As a snack I enjoyed the rest of the leftover Oatmeal Banana Bites rather than the suggested Red or Green Bell Pepper strips. Dinner was easy to prepare; I had the Quick Black Bean Chili but didn’t have the mixed green salad as I was short on time. The Chili was good, though the recipe called for 1/4 cup chili powder, which, to me, is way too much! Instead I used a tablespoon. I like how the recipe asked for fire-roasted tomatoes. It added a nice touch. For breakfast, rather than the suggested cereal with plant milk and fresh or frozen berries I finished off the remainder of the Green Apple Oatmeal since I made so darn much on the first day. In addition, I had a Green Glamour Smoothie (recommended for tomorrow’s breakfast). In the smoothie was banana, strawberries, blackberries, blueberries, and kale. I’m not really a blackberry fan but decided to give this a try. It tastes good though the seeds bother me. 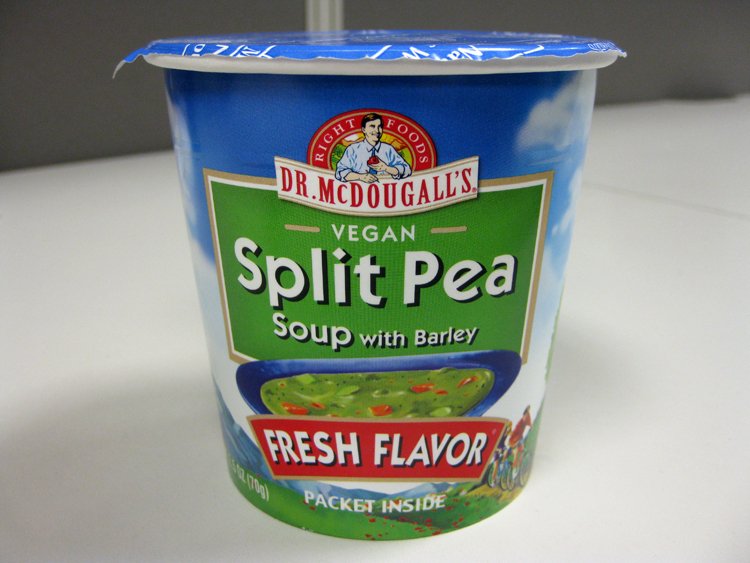 For lunch, I had Dr. McDougall’s Split Pea Soup which was very tasty itself. 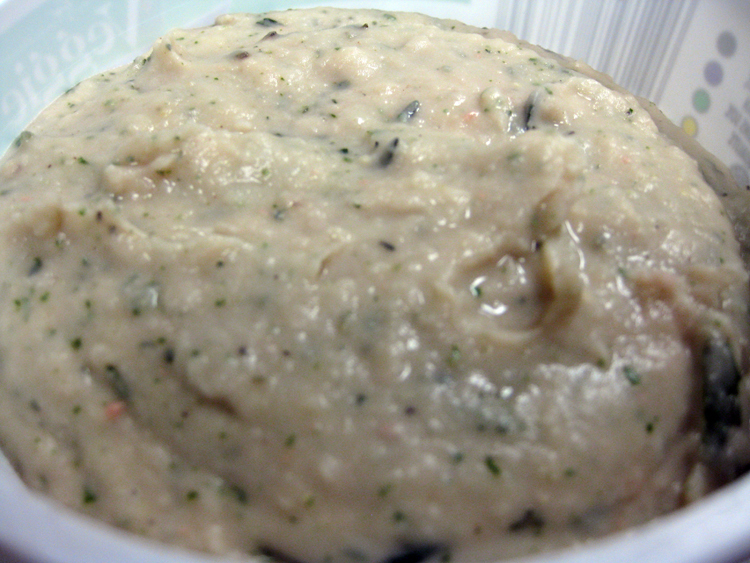 For a snack I had the White Bean Hummus with Fresh Thyme and Basil. Rather than eating it with whole grain bread, I opted to have carrots since I had a few to use up. For the Kickstart DIY dinner, to satisfy the green requirement, I prepared some balsamic asparagus (my creation), and for the grain and bean requirements I enjoyed some leftover Moroccan Bean Stew from day 2. Very satisfying! This morning I had another Green Glamour Smoothie for breakfast in order to use up the remainder of ingredients. For lunch I had Miso Soup with Shiitake Mushrooms. The miso soup was warm and wholesome, with broccoli, carrot, nori, tofu and shiitake mushrooms. Great on a cold winter’s day! 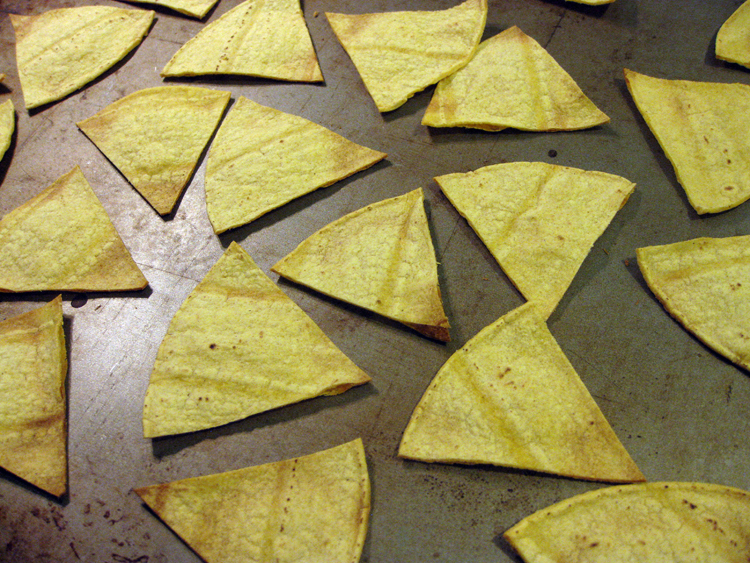 For a snack, I enjoyed the Mango Salsa with Oven-Baked Tortilla Chips. Since I had to go to to the store for a few things anyway, I went ahead and picked up some pre-made mango salsa rather than making it from scratch. I like how easy the chips were to make. All you have to do is buy some soft corn tortillas, cut them in sections and then bake in the oven for a few minutes. 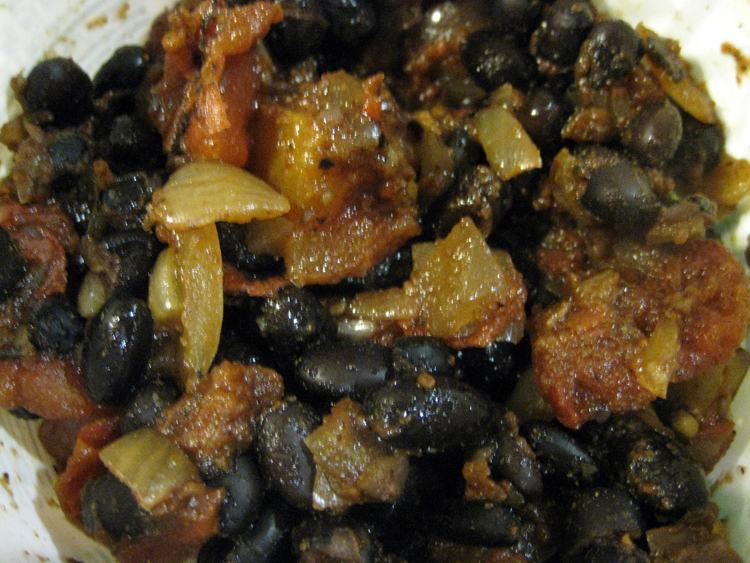 For dinner, rather than dining out as suggested, I had the remainder of my Quick Black Bean Chili, along with black beans, salsa and roasted red bell pepper strips, with some baked blue corn chips on the side. I was very much looking forward to the Chai Spice Pancakes and Facon Bacon this morning. I’m a huge breakfast fan and these sounded delicious! 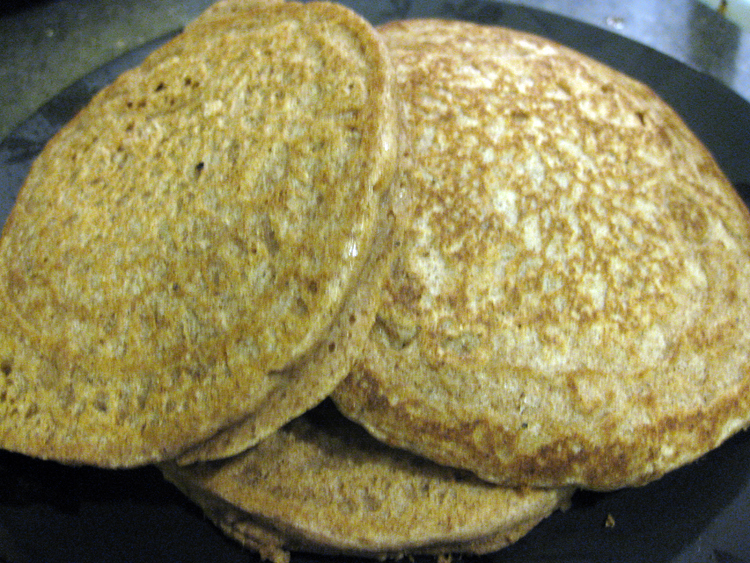 The pancakes had a wonderful aroma and a nice little kick thanks to the black pepper. The batter looked a little dry when mixing so I did add an additional 1/4 cup almond milk. When eating the pancakes I added just enough maple syrup to moisten them but not too much! For the “bacon”, I’m a tempeh fan so I enjoyed it. It didn’t have a bunch of sodium like regular bacon, but it had just enough for me. The crushed cumin and fennel seeds were a nice touch. 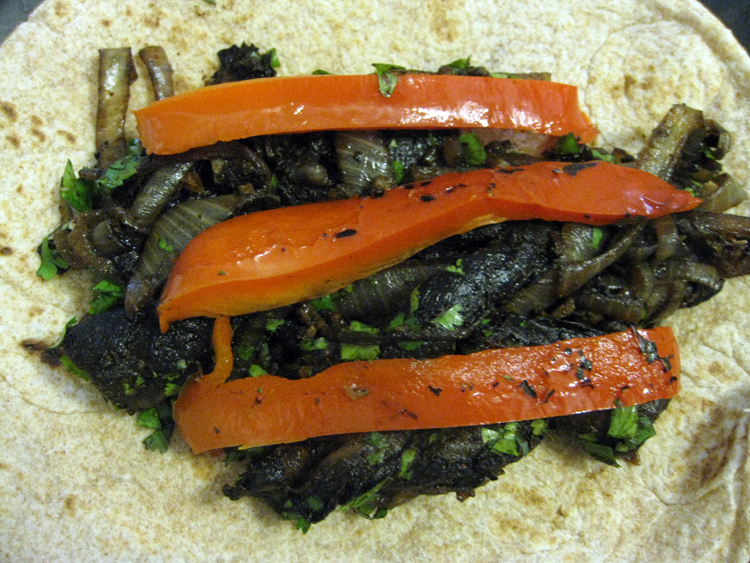 For lunch was Orange and Fennel Salad and Portobello Fajitas. 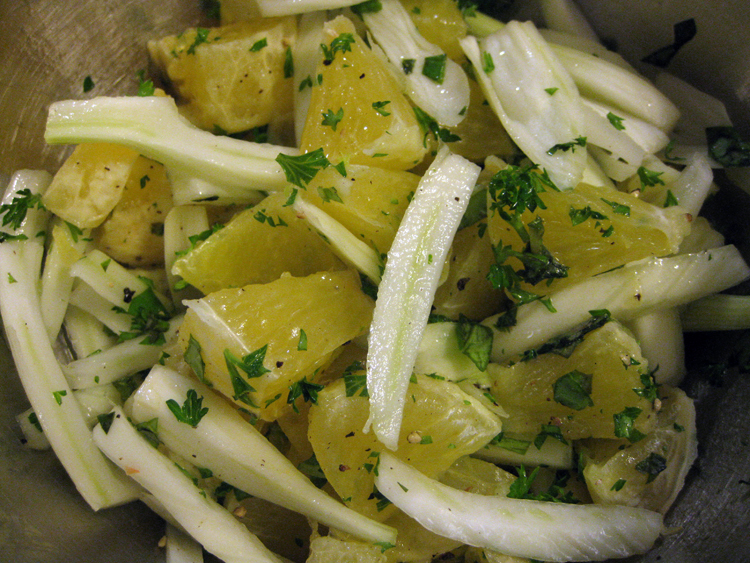 I’m not a fan of licorice so raw fennel isn’t my favorite, but the salad was actually pretty good. The oranges muted the heavy licorice flavor of the fennel, and the crispness of the fennel provided a nice contrast to the oranges. I also opted to add a tablespoon of capers as the program offered. The fajitas were decent as I’m always a fan of portobellos, though the flavor was a little muted when compared to the traditional version. I would have liked a little more flavor. Perhaps more lime juice? 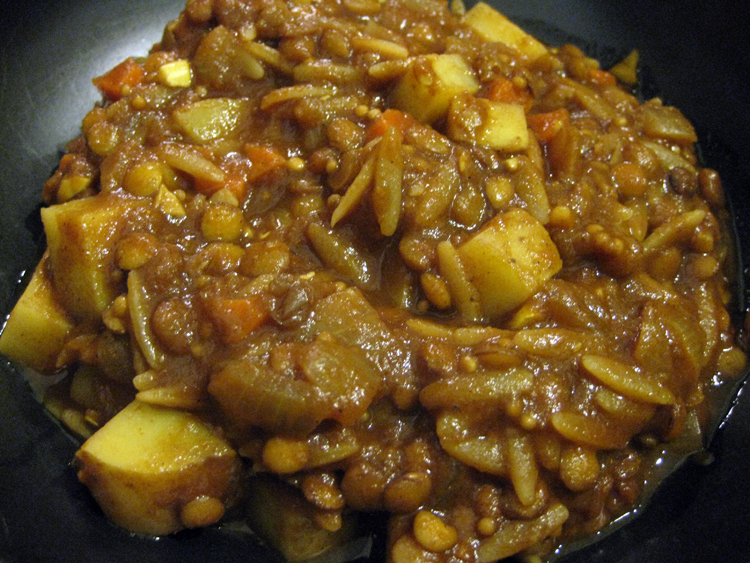 For dinner, rather than having the Oven-Baked Chickpea Ratatouille (which sounded delicious) with Always Great Brown Rice, I had the last of the Moroccan Bean Stew. Due to all the filling food I’ve had today, I unfortunately didn’t have room for the suggested dessert: Summer Fruit Compote! For breakfast today I had the Tofu Breakfast Scramble and some leftover Facon Bacon from yesterday. 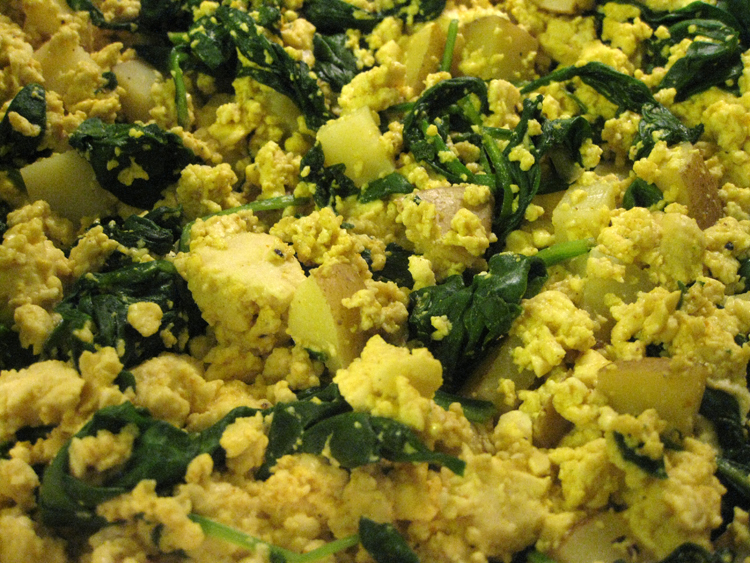 The scramble was actually pretty good and had a nice amount of flavor. In addition to the potatoes the recipe called for, I also added some spinach for extra color and nutrition. 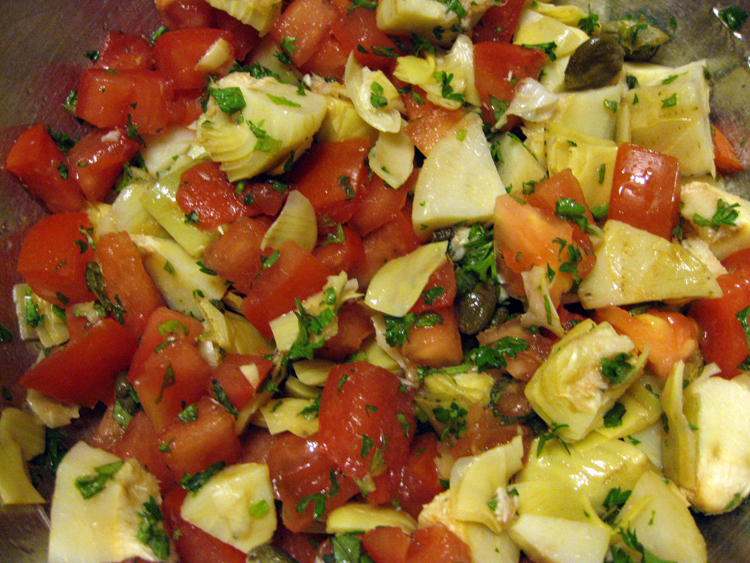 For lunch was the Artichoke Hearts and Tomato Salad. The recipe called for two tomatoes but I just used one in an effort to prevent from having any leftovers. The addition of capers to the mix was very good and added a nice, salty flavor. My only gripe about the recipe is the mint…sadly I wasn’t too fond of it. 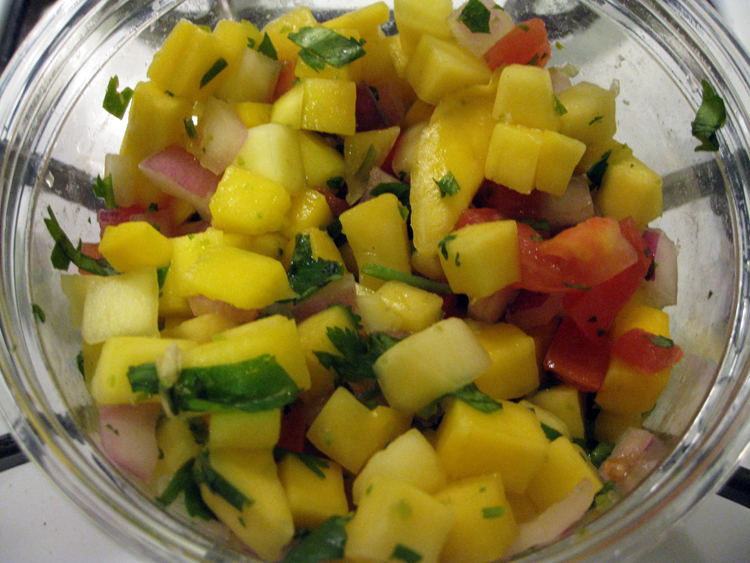 Skipping the suggested snack of fresh berries, I finished off some leftover Mango Salsa from day 5’s snack. The Israeli Couscous with Carrots, Peas and Red Wine Vinegar for dinner was very good, offering a variety of flavors and textures. The red wine vinegar added a nice little kick! 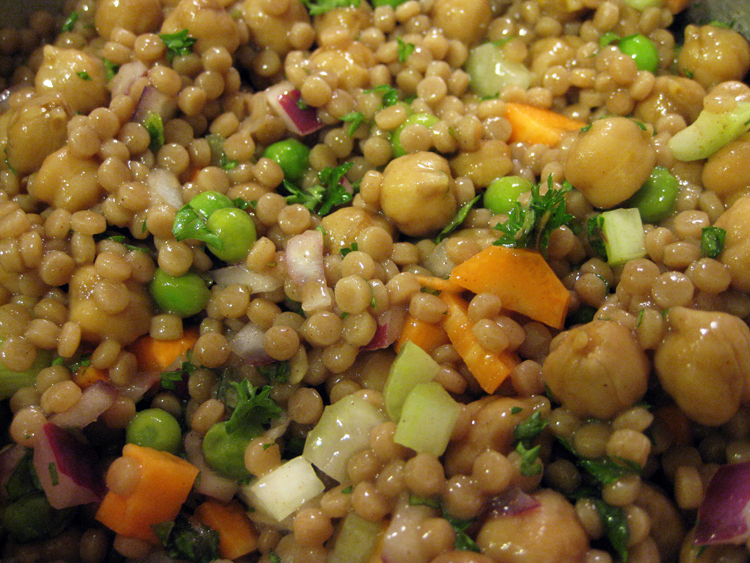 I also added some chickpeas to the mix that were leftover from day 1 — a great addition! 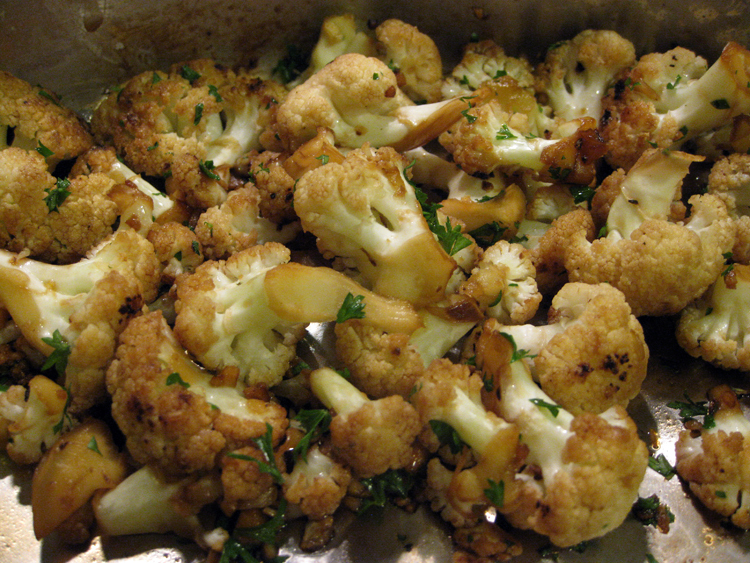 I also enjoyed the Seared Cauliflower with Garlic and Tamari. Delicious! I had been craving a little more sodium and this dish did not disappoint. Stay tuned for Days 8-14 of the 21-Day Vegan Kickstart program! NOTE: Vegan Food Addict is in no way affiliated with PCRM. The views and opinions expressed herein are strictly my own and do not necessarily reflect that of others. And much of it is! I recommend it. Thank you! I love him too, he is such an intelligent, nice man. One of my vegan heroes! To those who want to avoid gluten, I suggest substituting groats or steel-cut oats! You can buy gluten-free oats to avoid cross-contamination, though a GF friend of mine feels comfortable using McCann’s Irish oats. I love the chewiness of the oats themselves, and the inulin they release thickens up a broth nicely! Thanks for the tip, Bud! I’ve been a vegan for over a year but wanted to lose weight and rev up my eating so I started the 21-Day Vegan Kickstart this past week. Like you, I’m blogging about the experience which has been awesome so far!